A sidewalk near the White House is closed to the public permanently as of Wednesday night. “This restriction is part of the ongoing comprehensive review of temporary and permanent security measures at the complex,” the Secret Service said in a statement. Find out what vantage points you still have and why the move was made. WASHINGTON — A sidewalk near the White House is closed to the public permanently as of Wednesday night. The Secret Service announced Wednesday that the sidewalk along the south fence of the White House has been closed permanently at 11 p.m. Wednesday. Since 2015, the sidewalk and park land between the south fence and E Street Northwest, between West Executive Avenue and East Executive Avenue, has been closed between 11 p.m. and 6 a.m. daily. Wednesday night’s closure, however, is permanent. “This restriction is part of the ongoing comprehensive review of temporary and permanent security measures at the complex,” the Secret Service said in a statement. Last month, a man jumped the White House fence and spent 17 minutes on the grounds while President Donald Trump was inside. He looked through White House windows and managed to “rattle the door handle” before he was caught, Rep. Jason Chaffetz, chairman of the House Oversight Committee, told The Associated Press. They reported last week that two Secret Service agents on duty that night have been told they will be fired. Milhoan said that people who wanted to see or photograph the iconic view of the White House from the south would still be able to get it — just about 25 yards back, across E Street by the Ellipse. “Restricting public access to the fence line will not only serve to lessen the possibility of individuals illegally accessing the White House grounds,” said Milhoan, “but will also create a clear visual break to enable Secret Service officers to identify and respond to potential hazards, including individuals attempting to scale the fence,” said Milhoan. The new restriction won’t require building any new physical barriers, Milhoan said. The existing barriers simply won’t be opened in the daytime hours. 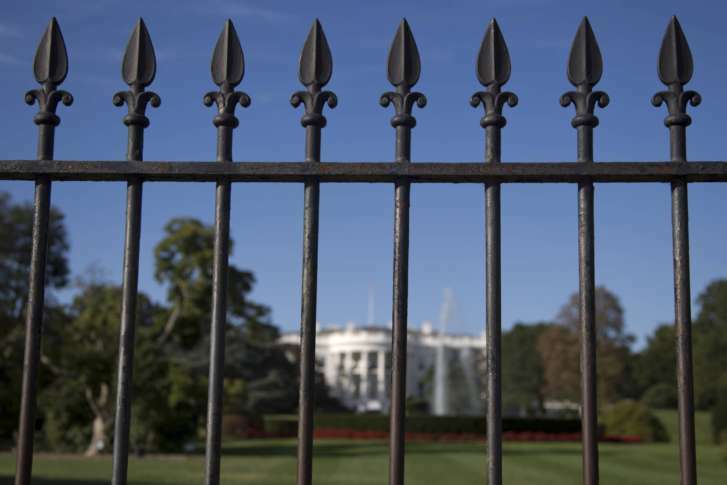 A higher fence around the White House was approved earlier this year, Milhoan said; the project will go out to bid later this year, and construction is slated to begin next year. “We always try to balance the public’s right to … access to our protectees and our facilities, and we work very hard to balance that challenge with the challenge of securing an 18-acre complex,” Milhoan said. On the map below, the upper arc represents the old fence line; the lower arc represents the new boundary for the public.